Visit a practising workshop to learn and refine the art of blacksmithing. Classes take place at Nicky’s forge in Milton Keynes, contact Queens Park Arts Centre for more information. Places must be booked in advance, don’t forget to bring a packed lunch. Classes are suitable for adults and students aged 16+. 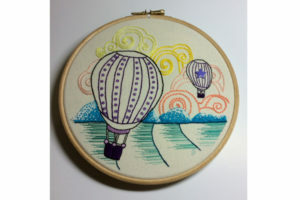 Learn embroidery techniques and create your very own hoop art piece. An extra£10 for materials payable to tutor on the day. Make some lovely handmade soaps, inspired by fragrances like Rosemary, Mint, Sicilian Lemon and Jasmine. £35 / £30 members. Additional materials purchasable on the day. Use special coloured tape and a marker pen to produce a strong textural image. Use an axe, chopping block, drawknives and spokeshaves to make a variety items useful in the kitchen or chicken run. Tools provided – bring your own if you have them! Discover how to create amazing glaze effects using the raku method of firing. Learn how to design, cut and copper foil, solder and add decorative details to stained glass pieces. £90/£80 members. An extra £10 for materials payable to tutor on the day. Make a riveted belt, dog collar or guitar strap, including stamping, decorating and finishing leather. An extra £10 for materials payable to tutor on the day. Places must be booked in advance. Workshops are suitable for adults and students aged 16+. Food is on sale in the Queens Park Coffee Bar or bring your own packed lunch. Prepare the leather and linings then learn how to saddle stitch a vibrant simple hand bag or messenger style bag. An extra £30-£35 for materials payable to tutor on the day. 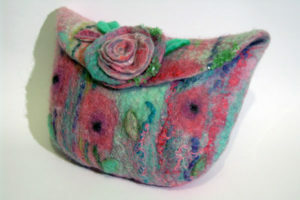 Learn to wet felt around a resist, choosing from an array of wools and silks. Embellish your beauty with beads, pearls or sequins. An extra £5 for materials payable to tutor on the day. Visit a practising workshop to learn and refine the art of blacksmithing. 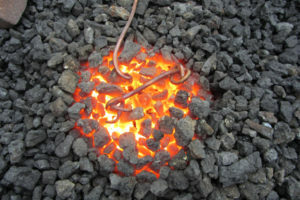 Courses take place at Nicky’s forge in Milton Keynes, contact Queens Park Arts Centre for more information. Places must be booked in advance; don’t forget to bring a packed lunch. Classes are suitable for adults and students aged 16+. Discover the art of block printing in this fun workshop for all ability levels. Drawing on folk art traditions, invoke the spirit of fish or bird then carve and colour your own 3D sculpture. Tools provided – bring your own if you have them! Learn the basic principles of throwing clay to make cylinders (the basis of most pots). 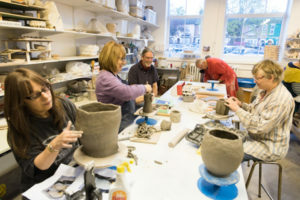 £60 / £55 members (per session) Clay included, plus firing and glazing for one pot. Places must be booked in advance. Food on sale in the Queens Park Coffee Bar or bring your own packed lunch. Classes are suitable for adults and students aged 16+ unless otherwise stated. Create some larger hand build pieces, or develop and practice your throwing skills. Ideal for novice potters looking to learn additional skills. 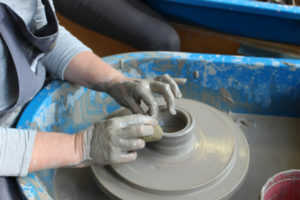 Includes a 5th day of glazing – date to be arranged with the tutor during the course. Places must be booked in advance. Food is on sale in the Queens Park Coffee Bar or bring your own packed lunches. 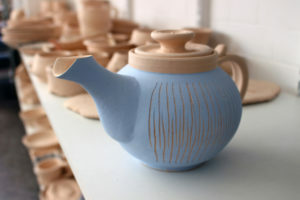 Learn how to create a ceramic teapot (students must already have experience throwing a cylinder). Places must be booked in advance. Course is suitable for adults and students aged 15+.